Although Fauchard, known as the "father of dentistry," who flourished some two hundred years ago, was a Frenchman, and his foremost contemporaries and successors for another century were Frenchmen, America has made all the modern improvement in dental arts. American dentists have not only invented the principal mechanical devices that are now in use among skilled practitioners throughout the world, but they have made the anatomical researches that have resulted in painless processes and prosthetic accomplishments deemed impossible a generation ago. Indeed, America may be said to have made dentistry a science all her own - with no outside assistance worth mentioning. German dentists have added to the knowledge of their American confreres certain minor chemical discoveries, but no other country has done aught else than copy American methods. Today the leading dentists of almost every capital in the world are Americans, as they have been for the last twenty years, and there is scarcely a city throughout the United States which does not contain one or more schools of dentistry superior in all respects to any in London, Paris, or Berlin. As a result of these interdependent conditions dental students from all civilized countries are flocking here to study the art. Not only are the principal European states represented in classes at our schools of dentistry, but students from Australia, New Zealand, Japan, and China are helping to carry American methods around the globe. The autocrat of the Breakfast Table maintained his preference for the man with the gallery of family portraits as against the one with the "twenty-five cent daguerreotype," a circumstance with which the dentistry of the period may have had something to do, from the view-point of that fastidious critic. Elderly people in the mid-century photographs almost invariably look from their somber frames with shrunken cheeks or puckered lips, a melancholy condition due to the loss of teeth faithfully depicted by Monsieur Daguerre's wonderful invention, since the man or women was compelled to perpetuate his features for posterity through the twenty-five cent medium rather than the oil painting was likewise more often than not unable to afford the services of a professional dentist, or else believed dental prosthesis to be impracticable, or its encouragement frivolous. Of course the gentlemen and ladies in the galleries of family portraits to which Doctor Holmes alluded may, or may not, have been fitted with artificial teeth that preserved the contour of their cheeks in old age, since it was in the power of the artist to rectify any facial defects; but those of his subjects whose features had been thus artfully improved had undergone actual and acute suffering in the process, at the hands of the dentists of those days. Indeed, so short a time ago as fifteen years, Prof. John E Sweet, of Cornell University, in an article in Cassier's Magazine, declared, "Punishment, misery, and torture cannot be avoided or modified in any dental operations, except in extracting, and where negligence has led to that necessity the one that does not profit by the use of anesthetics (provided there is no heart trouble) suffers for his folly." Professor Sweet describes the torture he personally endured in the operating-chair under the most skilled dental artists of that comparatively recent period, in a manner to lessen our respect for the ingenuity of the ancient inquisitors of Spain. He wrote with a missionary purpose, however (as, indeed, did some of the holy men who described the Inquisition - and perhaps exaggerated its horrors), his article concluding thus, "Should any young people read this some good will have been done if they take warning and have their teeth attended to when they first need it." 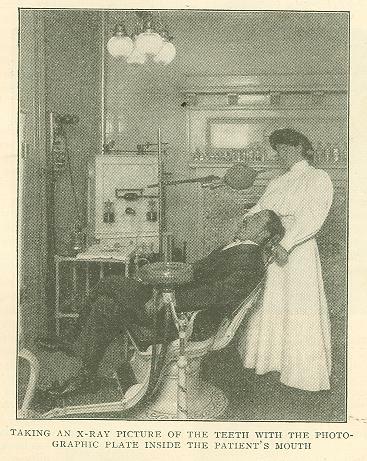 To-day almost any of the ordinary dental operations may be performed with nothing more than slight discomfort to the patient, though it is only within the last five or six years that the extraction of a sound tooth, or the extirpation of a nerve, by means of local anesthesia, and absolutely without pain, has been made possible. The very newest thing in dentistry is the gold "inlay," whereby the patient, while the gold filling is being made to fit a cavity, may read his newspaper or go for a walk, the filling not being put in place in the tooth until it is completed, when its installation is a matter of a few seconds. A comparatively recent development in dental science is the use of the X-ray, not only in diagnoses, but as a therapeutic agent in the healing of diseased tissues and maladies of the skin. The implantation of natural teeth, taken from the jaw of another (a process that has been known for nearly twenty years and, in fact, was attempted a hundred years ago by John Hunter, a celebrated English surgeon), is now being employed with increasing success. The use of a silicate cement obtained from Germany, known as Ascher's enamel, a flint-like, translucent material that is readily matched to the natural teeth, is also a recent acquisition in the filling of minor cavities. To the dentist is now often committed the setting of broken jaws, since he is more familiar with the anatomy of the lower part of the skull than is the average surgeon; and specialists in dentistry are treating, with almost unvarying success, children who came into the world with cleft palates and harelips. Dentists also move irregular and misplaced teeth, expanding the roof of the mouth and the "dental arch," to permit the teeth to align themselves naturally. The same operation is also performed to improve the contour of the face, and to broaden the nasal chambers for the purposes of increasing breathing capacity. In no other direction, however, has prosthetic dentistry made such progress as in what is known as "crown and bridge work." by means of which benevolent invention, or series of inventions, hundreds of men and women who had previously given up hope of ever again being able to partake of food without discomfort have already been enabled to renew natural mastication. In this branch of the profession the dentists of to-day are exhibiting extraordinary mechanical talent, and many are the patients that rise up from the operating-chair to call them blessed. Although the crown and bridge system has been employed in dentistry for perhaps twenty-five or thirty years, it is within the last fifteen years that it has been brought to its present degree of utility, and within a much less period that that the best examples of the work have been executed. Only a very few years ago the dentist considered it quite an achievement to put two or three teeth on a "bridge," whereas the expert of today, given four or five teeth with sound roots in certain relative positions to each other in either jaw, will fit his patient with a complete set of teeth - incisors, cuspids, bicuspids, and molars. The advantage of the crown and bridge process over the older usage of affixing artificial teeth to a "plate" lies not only in the fact that the plate, which is a continual source of annoyance to the person using it, is done away with (the subject of a skillfully performed crown and bridge operation being unaware of a foreign substance in the mouth) but that under the more recent method the new teeth are as firm as those that grow in the jaw. In cases where the teeth remaining in the jaw are not in such positions as to furnish "abutments" for the bridges, however, the old method is still of necessity employed. In every case that comes before him the dentist is likely to discover an entirely new problem in crown and bridge work, and it is his mechanical ingenuity - his engineering skill, it may be called - in taking advantage of conditions that makes for a successful operation. As an illustration of what has been accomplished by the crown and bridge system, there may be cited an operation only recently completed by one of the younger New York dentists, who, while he admits that it is a respectable piece of work, declares that it is by no means the summit of dental achievement in that line. To this dentist there came an unhappy man of middle age who had his four upper front teeth knocked out by an accident. He was the more concerned over the loss of the incisors, since, by reason of early neglect, he had previously been deprived of four molars and two bicuspids, also from the upper jaw, one bicuspid and two molars being missing from each side, the other two bicuspids - those next the cuspids - being partially decayed, while the cuspids were thoroughly sound, as was the third molar, or wisdom tooth, on the left side, and the second molar on the right. Out of nature's complement of sixteen teeth in the upper jaw, the patient had retained only four in sound condition, and two with sound roots, and he was contemplating a cheerless future so far as participating in any other than the liquid pleasures of the table was concerned. The dentist found posterior abutments in the wisdom tooth on one side and the second molar on the other, both of which he crowned with gold, and anterior abutments in the two imperfect bicuspids, which he removed at the roots, affixing gold-faced porcelain crowns. The cuspids were not touched at all in the operation, the bridge containing the four front teeth being carried around the two natural ones by a gold band so close to the gums that the patient cannot even feel it with his tongue. The other two bridges on either side of the mouth brought the number of teeth in the jaw up to fifteen - the missing wisdom tooth not being replaced - and the patient was qualified for membership in a beefsteak club. The proud person who holds (literally) the record in crown and bridge work has five bridges in his mouth, and is not ordinarily conscious of their presence there. Three of the bridges are in the upper, and two in the lower jaw, and twenty-two of his thirty-two teeth are artificially constituted. As has been said, the most recent achievement in modern dentistry is the use of the gold inlay, by means of which the patient is relieved of any but the least handling of a tooth under treatment, after the cavity has been prepared for the gold that is to fill it. Instead of hammering in the gold, as was the only process until within a few months ago, the dentist now takes a wax impression of the cavity, from which he constructs a mold into which the gold is poured in a molten state, the resulting cast being the inlay, and of course a facsimile of the wax model. The inlay is then slipped into the cavity, which it fits exactly, and is secured with cement. The porcelain inlay has been known in dentistry for a little more than fifteen years, and during this entire period dentists have been endeavoring to find some method of adapting the process to gold, which is the only suitable material for filling a tooth at the biting edge, being malleable and ductile, whereas porcelain is brittle and breaks under pressure. It was found impossible, however, to cast a gold inlay that would not shrink, until the present machine was invented whereby pressure is applied to the metal in the gold by means of compressed air. The gold inlay possesses another advantage, aside from the relief afforded the patient in doing away with the hammering of gold into the cavity, in that it may be employed successfully in teeth so frail that the shell would collapse under the hammering process. Wonderful results have been attained by the use of X-ray by those specialists in dentistry who devote themselves to oral surgery. In diagnoses the X-ray has proved peculiarly adaptable to the location of abnormalities in the teeth, jaws, and face, the nature of which, in many instances, could not have been determined by any other method known to science; and alveolar abscesses, lupus, acne, enlarged glands of the neck, and even cancer have been cured by its use. In cases of facial neuralgia, due ninety-nine times out of a hundred, to some disorder of the teeth, the X-ray is almost infallible, and it is impossible to locate the seat of trouble by any other means. In a diagnosis by X-ray the radiograph may be taken either inside the mouth or through the face. While the former process requires a high degree of skill on the part of the operator, it is a simple matter for the patient, the plate on which the picture is to appear being enclosed in a waterproof covering and placed over the affected teeth, being then subjected to the rays for a few seconds. The negative on being removed at once discloses any condition aside from normal in teeth or gums. One of our leading dental specialists with the X-ray recently had as a patient a young man who was suffering from an enlargement of the lower jaw that might have been diagnosed as cancer, which would have resulted in an operation and led to permanent disfigurement. The use of the X-ray discovered the fact that two un-erupted teeth - as dentists call those that have not come to the surface of the gums - had been forced from the lower part of the jaw into the surrounding tissue. The dentist removed them through the patient's mouth, when he was at once relieved. He bears no trace of the operation, of course. A somewhat similar case was that of an elderly lady who had been in great pain for several days as a result of facial neuralgia, the cause of which it was impossible to locate. The X-ray showed an un-erupted tooth from the upper jaw embedded in the tissue under the eye, and it was removed with little difficulty. Such incidents are, however, every-day matters with the X-ray specialists. Scientists tell us that the teeth that, by reason of disuse, man is to lose next are the third molars, or wisdom teeth. In some persons they are even now rudimentary, while with others they do not develop normally. A serious condition is often brought about when an un-erupted wisdom tooth develops or grows sidewise, and becomes impacted between the ramus of the jaw and the second molar. The X-ray is the most satisfactory means by which this condition may be discovered, as the necessity for probing and cutting is prevented. More marvelous, than anything else in dentistry, perhaps, are the results obtained by the specialists in "orthodontia" and "Orthopedia of the face," the word signifying the moving of misplaced teeth to a correct position, and the phrase the correction and prevention of facial deformities brought about by defects of the teeth and jaws. Not only does the expert turn twisted teeth in their sockets, and straighten those that are tilted, malposed, impacted, or otherwise out of alignment, but he brings a prognathous jaw to its natural position, and rectifies almost any irregularities of the lower part of the face. While this work is easier and simpler with children, it is nevertheless successful, not only with adults, but with old men and women, although without ocular proof of what has been done in this direction the results would seem incredible. Most extraordinary results in orthodontia and orthopedia have been accomplished by dental specialists in our large cities. One of these practitioners has invented what he calls the "humane process," and presented it to the profession at large. The apparatus he has devised is transposed to meet the requirements of each particular dental malformation that may come before the operator, but it may be roughly described as a sort of wire harness for each tooth under treatment, fastened to an anchorage over other teeth, a regulated force being applied by the use of tiny springs of varying strength, scientifically systemized. When the dental arch is to be broadened a U-shaped loop with a spring is fastened inside it, and the pressure regulated in a similar manner. From the clumsiness of this description one would scarcely believe it possible that such an apparatus could be tolerated in the mouth for even the briefest period. Nevertheless, with such a high degree of mechanical skill are the wires, loops, and springs (all generally of gold) adjusted that the patient wears the device without serious inconvenience, and is able to eat with little difficulty. It seems astonishing also that a degree of pressure so slight as not to cause the patient distress should be powerful enough to move the teeth in their sockets and even to change the shape of the dental arch, but there are hundreds of men, women, and children in various parts of the country to attest the practicability of the system. Originally published in The Cosmopolitan Magazine, June 1908. Written by Frank Marshall White.